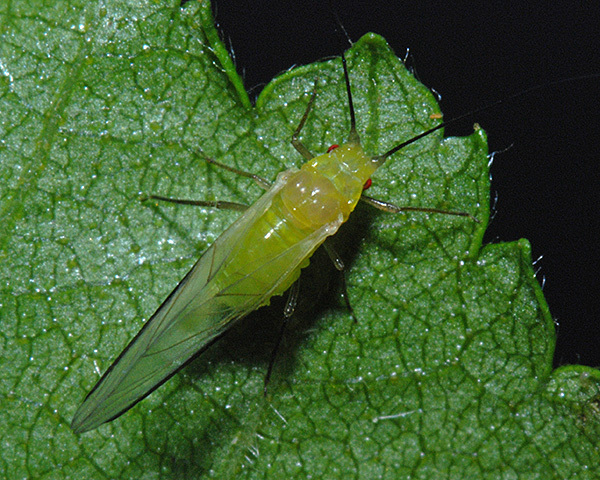 Monaphis are very large aphids with all adult viviparae winged. 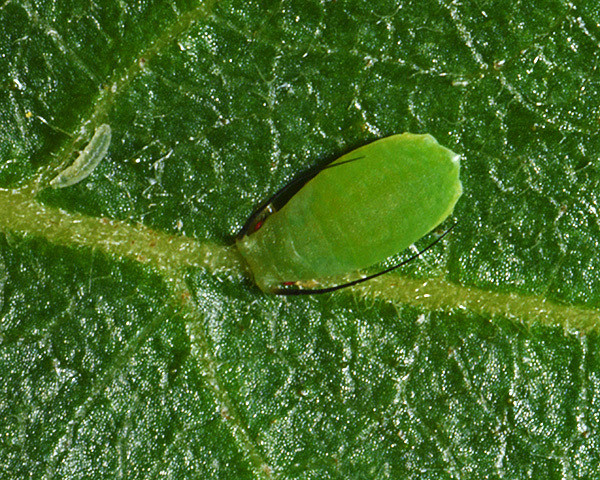 They are robust, ventrally flattened, green aphids with very long thick black antennae and a conspicuous elongate dark pterostigma in the forewing. There is only one species in the Monaphis genus (Monaphis antennata) which lives solitarily on birch (Betula spp.) in Europe and much of Asia; also recorded from the USA. It has a sexual stage in is life cycle, but does not host alternate and is not attended by ants. Adult winged forms of Monaphis antennata are green, with very long thick antennae that are black except at the base. The terminal process of the antennae is nine times as long as the base of the last antennal segment. Their siphunculi are very short with a flange. The cauda is tongue-shaped and not constricted. The forewing of the alate has an elongate dark pterostigma. The body length of an adult Monaphis antennata is 3.3-4.3 mm. Immature Monaphis antennata (see second picture above) are cryptic, and usually lie along the mid-ribs on the upper sides of leaves. Monaphis antennata live solitarily on birch (Betula spp.). They migrate to the undersides of the leaves for the final moult. Sexual forms occur in September-October. They are found in Europe, eastward across Asia to Siberia, China and Japan.